I was humming Don McLean’s tune as I was working on this 1980’s mixte with questionable provenance, a bike which I had recently accepted back into the fold after years of hanging at a friend’s business location as a display bike. I have come to embrace this Don McLean lyric, at least with regard to consumers and their bicycles. Notice, I did not say riders. Too many Americans buy things which they do not actually use, and that means that buying a bicycle does not make you a cyclist. The irony, nuance, and humor of McLean’s lyric resonates with me. There are so many ways to experience the value vs. outlay idea. I had planned on simply donating this mixte to my favorite bicycle charity: the Community Cycling Center. But, when the bike arrived unexpectedly at my office, several interested parties emerged, especially after learning that I planned to donate the bike immediately. This made me think about what it means to “give”, as well as what risks and rewards are involved in giving a bicycle away. I was feeling especially philosophical as I pondered these questions. The antidote to that was to get the bike into my shop and give it an overhaul. 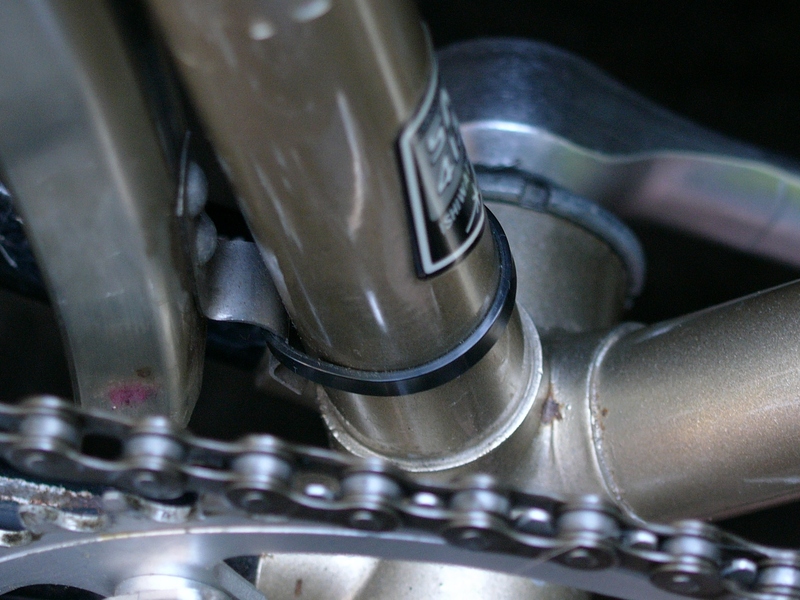 The first problem was that the headset’s grease had congealed into something resembling hard wax that got left in the can too long, and the steerer would barely turn. Possibly the bike was hanging near a heat vent during the last 5 years? I couldn’t imagine sending this bike out without having at least applied some fresh grease to the headset, but after 5 years of not being ridden, anything was possible. The headset condition made me do a complete evaluation of the whole bike, which I had apparently converted to a single speed, lo those many years ago. 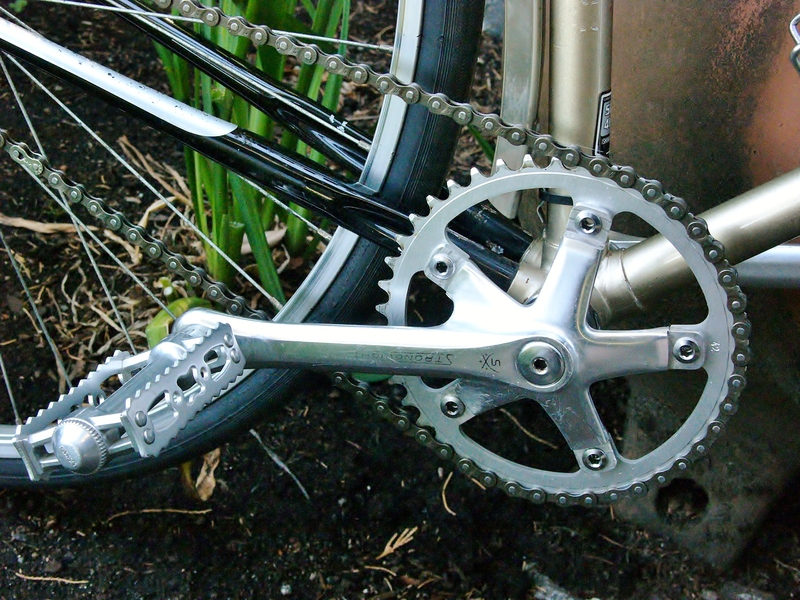 Stronglight crankset with 42 T ring. Shimano single speed 18 T freewheel. Nice forged dropouts. There was a time when I tried out single speed riding. I found it didn’t suit me, although not having to worry about shifting was kind of nice in its own quirky way. 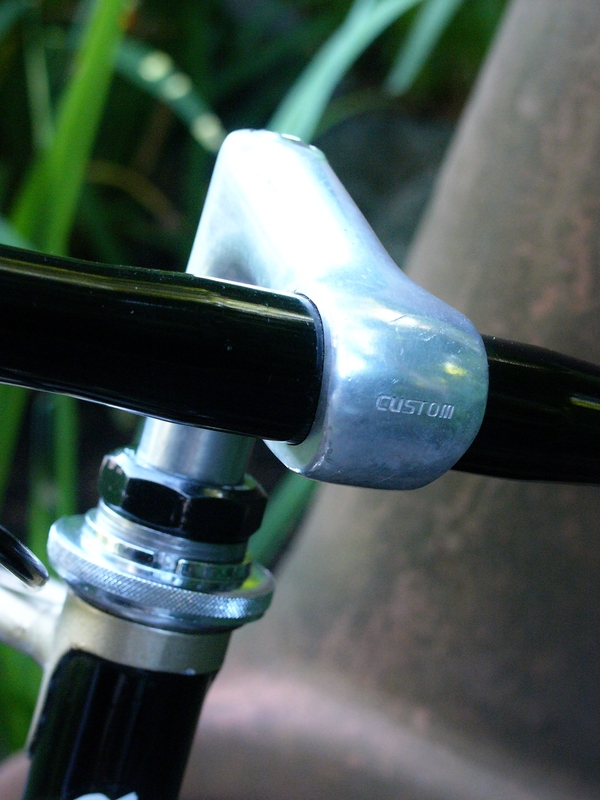 Recently I had a single speed adventure on my 1929 Griffon, and I thoroughly enjoyed it. So, I may re-think my aversion, but for now I focused on my task which was to make sure the bike was safe to ride and properly set up. The gearing on this bike, with its 42 tooth front ring and 18 tooth cog yields a 63 inch gear (or 4.7 gain ratio), given its 27 inch wheels. As an all-round gear, maybe that’s okay for a reasonably fit rider using the bike on surface streets. This is a Saint Tropez mixte built with Ishiwata 4130 Chro-Mo tubing. It is not a low end frame, but what I remember about the bike is that it had a number of low end (or unknown) components, as originally configured. Like so many mixtes, this bike is NOT designed for a small rider. The effective top tube length on this bike is 56 cm, even though the seat tube measures 50 cm. I will reiterate again that mixtes are for people who want to step through the frame rather than swing a leg over the bike. Mixtes are ideal for cyclists who prefer riding in street clothes or business attire. Mixtes ARE NOT automatically ideal for smaller riders. 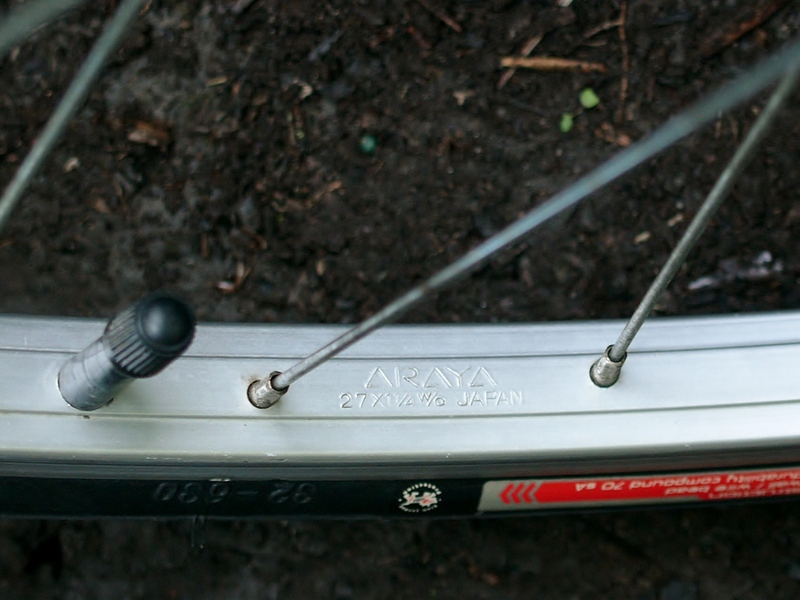 Araya 27″ alloy rims laced to Suzue hubs. Chain stay/fender zip tie attachment. 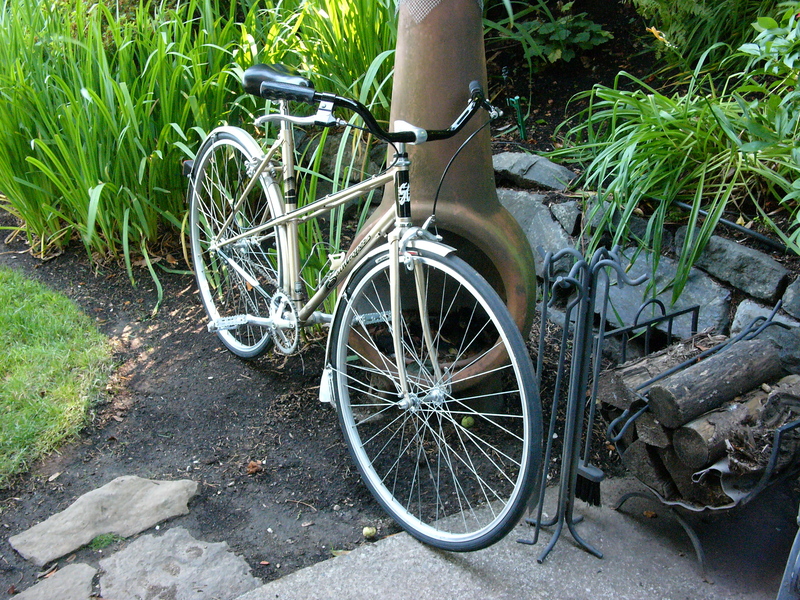 I set this bike up with upright bars and mountain bike levers. 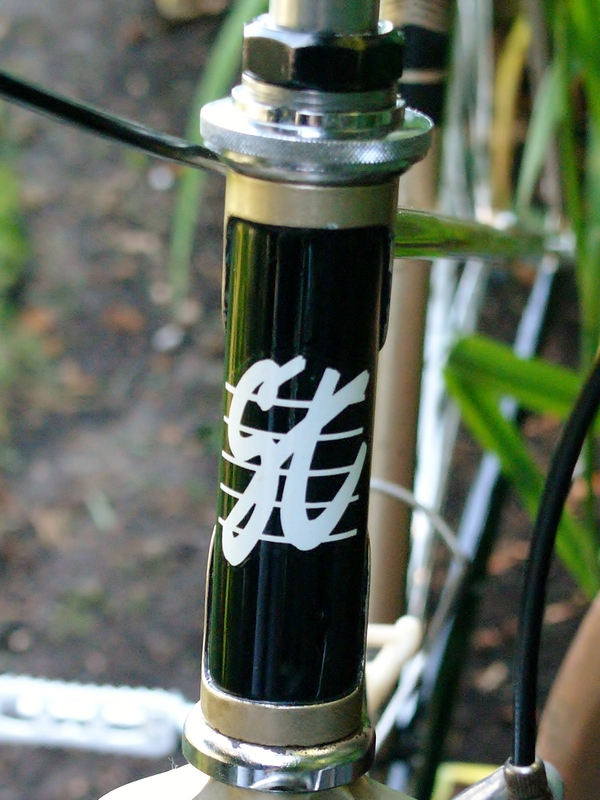 There was no bridge at the chainstays, so I zip tied the fender bracket to the seat tube. 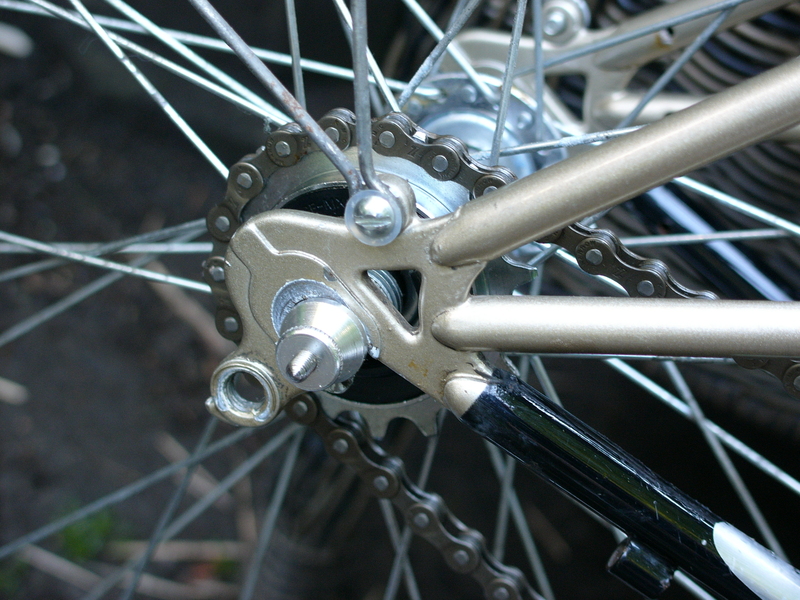 The bike has single eyelets front and rear, and braze-ons to accommodate both center pull and side pull brakes. The gray Dia Compe replacement pads work well with these Araya alloy rims – there is no break squeal and they are very effective at stopping the bike without being grabby. Probably they would work well with steel rims as well. But what the heck is this bike? It appears that Saint Tropez was a Japanese marque which seemed to exist in the 80’s and possibly early 90’s (and maybe the late 70’s). 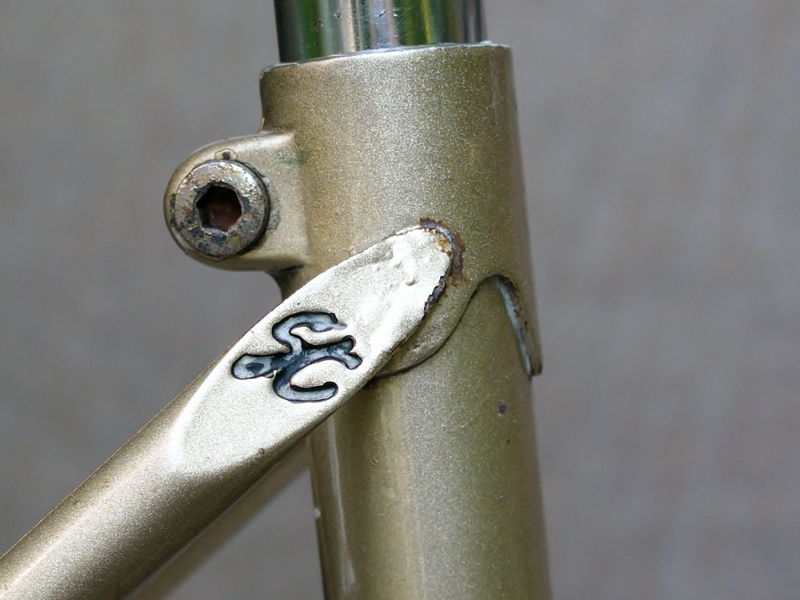 The SN on the bottom bracket indicates that this might be a 1985 model, which corresponds with the bike’s appearance and components. 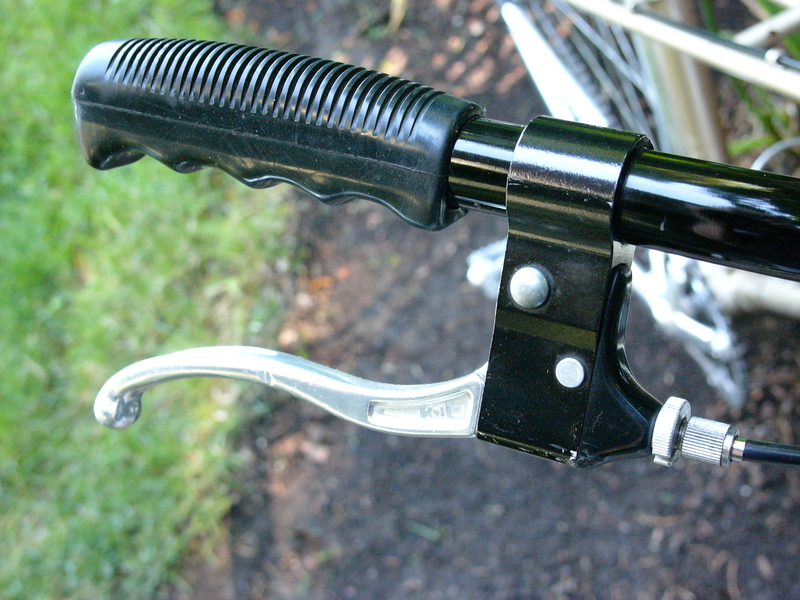 The engraved seat stay attachment is a surprising feature, given the simple lugs. The gold sparkle and black paint scheme is really attractive, though. So, as a “gift”, what is this bike worth? Will it be valued by its new rider, or will it have no value, because nothing was paid for it? I do hope that its new owner enjoys riding it. I hope it is worth more than what was paid. 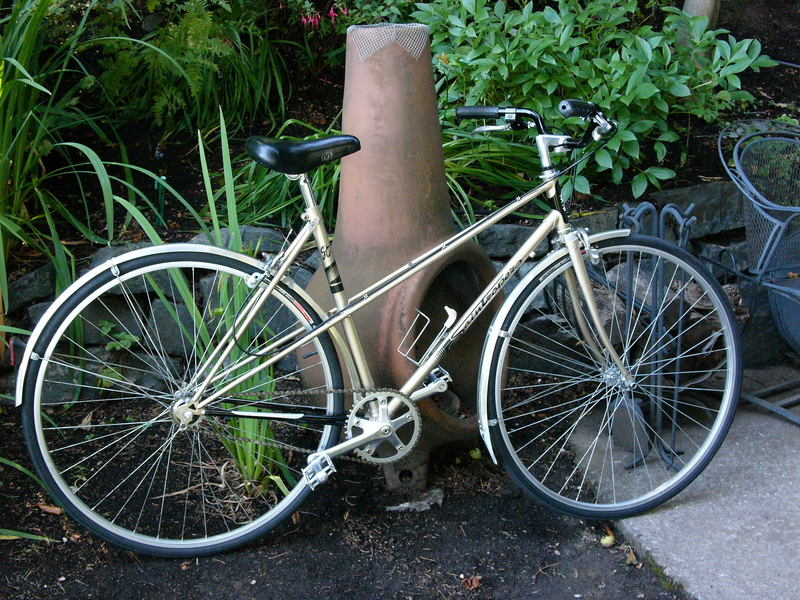 This entry was posted in Bicycle restoration, Mixte, Shorter cyclists, town bike, Vintage Japanese Bicycle and tagged Araya rims, Ishiwata 4130, Saint Tropez bicycle, single speed conversion by Nola Wilken. Bookmark the permalink. Hey, that is a very pretty bicycle! Are those handlebars any particular model? What about those ries? Can you tell us anything about them? 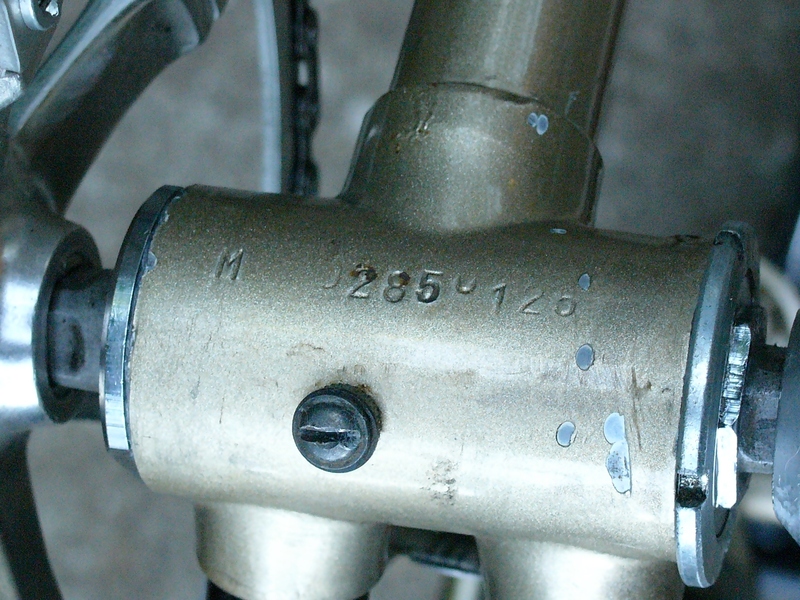 One last question: How common was it, in the 80’s, for a mixte to have Ishiwata tubing? Just make sure this goes to the right person. I am quite sure that many riders would be thrilled with such a nice bike. I agree – it’s a very attractive frame. 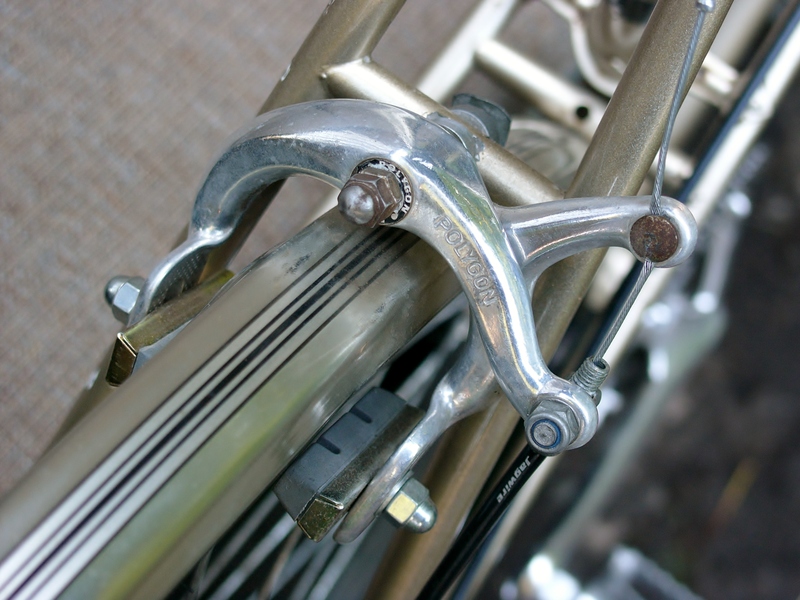 I have actually found many vintage mixtes built with high end tubing – Reynolds, Tange, Columbus, Vitus. 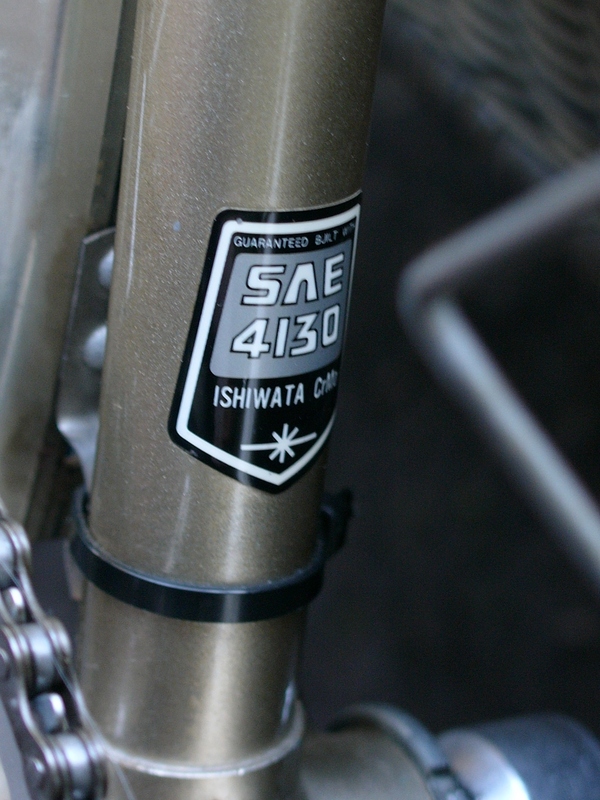 But this is the first mixte I have encountered with Ishiwata tubing. But, it makes sense, given the bike’s 1980’s time frame. My research on Ishiwata indicates that this tubing was comparable to Reynolds and Tange, but that the company went out of business in 1993. Kaisei tubing is its direct descendent – highly regarded Cro-Mo tubing which is the product of choice for many of today’s builders. I don’t recall who made the bars – but they do have a nice bend which is perfect for comfortable city riding. I always enjoy the detective work in trying to figure out what the last bike to enter the workshop actually is. Sometimes trickier than you might think, especially when components have been replaced. Yours looks to be in very good condition. Thanks, Alex. The bike was no slouch in its time, and hopefully will provide a new rider with many miles to come.